Tributes have been pouring in for South African silver Olympic medalist and former 800m world champion, Mbulaeni Mulaudzi. Mulaudzi was killed in a car accident on his way to an athletics meeting in Johannesburg yesterday afternoon, the South African President Zuma’s office, said in a statement. “The nation has lost a true hero and one of our most disciplined and talented athletes who flew the South African flag across the sporting world,” said Zuma. 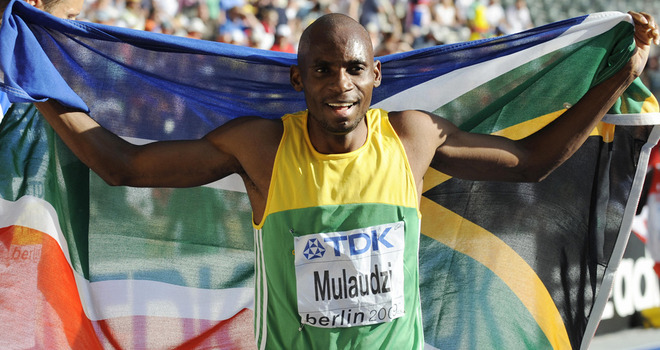 Global athletics body IAAF also released a statement and was “deeply saddened” to learn of Mulaudzi’s death. Before his retirement he won gold at the 2002 Commonwealth Games, bronze at the 2003 World Championships, followed by gold at the 2004 World Indoor Championships and silver at the 2004 Olympics. He also went on to win two more medals at the World Indoor Championships, taking silver in 2006 and 2008. He won the 800m title at the World Championships in Berlin in August 2009, then set a personal best of 1m 42.86secs in a race in Italy two weeks later. Mulaudzi did not compete globally after 2009, but remained on the athletics circuit until 2013.